DOCOMO actively researches and develops network related technologies such as W-CDMA, LTE, LTE-Advanced and 5G, and new service related technologies such as AI and IoT, with the ultimate goal of enhancing mobile experiences for customers. We are also applying for patents on these technologies. As a result, DOCOMO is having some 5,500 patents in Japan and 9,300 patents overseas as of March 2018. DOCOMO is steadily expanding the scope of its intellectual property in order to strengthen its competitiveness in Japan and abroad. DOCOMO increased the number of 5G patent applications as the efforts toward standardization of 5G specifications gained momentum in FY2017. 5G aims to achieve a high capacity network which is able to support increase in traffic with low cost and reduced power consumption. DOCOMO is conducting research and development to enable a wide range of capabilities such as super high data rate communications of over 10Gbps, lower latency, and simultaneous connection of a large number of terminals in order to support the future spread of M2M communications and IoT, and promoting relevant intellectual property activities. To achieve the Medium-Term Strategy 2020 "Declaration beyond" goals, DOCOMO has been applying on patents for service solutions utilizing AI and IoT. In particular, DOCOMO is strengthening intellectual property activities by applying patents on AI agent related technologies such as intention interpretation and natural dialogue technology, and drone related technologies such as agricultural support technology and operation management technology. DOCOMO has been applying for and maintaining trademarks in order to protect its product brands and service brands. DOCOMO has approximately 1,400 trademarks in Japan and 1,300 trademarks overseas as of March 2018. DOCOMO licenses its standard-essential patents 1 on FRAND (Fair, Reasonable and Non-Discriminatory) terms. 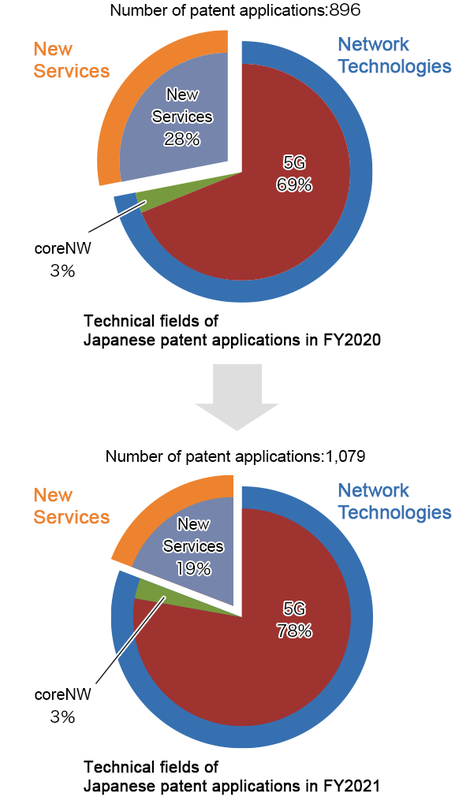 DOCOMO has owned more than 6,000 patents/patent applications worldwide in the field of 3GPP standard-essential patents and continues to license them through both bilateral negotiation and patent pool. DOCOMO has granted a patent license to Xiaomi. The agreement covers DOCOMO's cellular wireless standard-essential patents. DOCOMO has granted a patent license to KYOCERA Corporation. The agreement covers DOCOMO's W-CDMA, LTE and LTE-Advanced standard-essential patents. DOCOMO has granted a patent license to Samsung Electronics Co., Ltd.
DOCOMO has granted a patent license to Sharp Corporation. The agreement covers DOCOMO's W-CDMA, LTE and LTE-Advanced standard-essential patents. DOCOMO has granted a patent license to Microsoft Corporation. The agreement covers DOCOMO's W-CDMA, LTE and LTE-Advanced standard-essential patents. DOCOMO has granted a patent license to HTC Corporation. The agreement covers DOCOMO's W-CDMA, LTE and LTE-Advanced standard-essential patents. DOCOMO has granted a patent license to HUAWEI. The agreement covers DOCOMO's standard-essential patents for wireless communication technologies. DOCOMO has granted a terminal patent license to LG Electronics Inc. The agreement covers DOCOMO's W-CDMA, LTE and LTE-Advanced standard-essential patents. Alternatively, it is also possible to obtain licenses to our standard-essential patents through the following patent pools 2. If you are interested in taking a pool license, please contact the concerned Licensing Administrator. 1 Standard-essential patent: A patent which is unavoidably infringed when manufacturing a standard-compliant product without a license from the patent owner. 2 Patent Pool: A mechanism whereby a plurality of patent holders collectively license standard-essential patents.